Origin & Soil: vineyards in the areas of Barbaresco, Treiso, Alba and Monforte. Formed originally by strong marine currents in the Miocenic era, the soil is a mixture of sand and clay. Taste: Ruby red in colour. On the nose, fragrant, fruity bouquet with hints of flowers. This is a very versatile piedmontese wine and a perfect match for a variety of dishes. Ideal serving temperature is 16°C and it is best enjoyed between 1 and 3 years vintage date. Climate Vintage: The 2005 vintage has an irregular climate but to sum up it is satisfying. After a relatively mild winter, with scarce precipitations, there is a fresh but poor in rains spring. At the start of summer, there is an heavy thermic rise with some fresh periods but without rains. September starts with some rainy days. Then the climate has stabilized and it comes back summer until the end of the month, with large temperature ranges, useful to exalt the sugar and the aromatic substances stored in the grapes. Vinification: The grapes, harvested the 16th of September to the 28th of September, appear healthy, with an excellent sugar content and a good level of acidity.After pressing, the grapes arrive at a temperature of 27-28°C, with a maceration of 7 days. The malolatic fermentation ends in the middle of December, the wine stays for some months in tanksteels and it is bottled in Spring. "Wine Spectator" has rated the wine "Prunotto Dolcetto d'Alba, Piedmont, Italy" from the vintage 2015 on 31.12.2016 with 89 of 100 points. "Wine Spectator" has rated the wine "Prunotto Dolcetto d'Alba, Piedmont, Italy" from the vintage 2014 on 15.11.2015 with 87 of 100 points. "Wine Spectator" has rated the wine "Prunotto Dolcetto d'Alba, Piedmont, Italy" from the vintage 2013 on 30.11.2014 with 89 of 100 points. "Wine & Spirits Magazine" has rated the wine "Prunotto Dolcetto d'Alba, Piedmont, Italy" from the vintage 2011 on 01.12.2013 with 88 of 100 points. "Wine Spectator" has rated the wine "Prunotto Dolcetto d'Alba, Piedmont, Italy" from the vintage 2011 on 31.03.2013 with 88 of 100 points. "Huon Hooke" has rated the wine "Prunotto Dolcetto d'Alba, Piedmont, Italy" from the vintage 2010 on 14.06.2012 with 89 of 100 points. "Vinous Antonio Galloni" has rated the wine "Prunotto Dolcetto d'Alba, Piedmont, Italy" from the vintage 2010 on 01.11.2011 with 87 of 100 points. "Vinous Antonio Galloni" has rated the wine "Prunotto Dolcetto d'Alba, Piedmont, Italy" from the vintage 2009 on 01.08.2010 with 89 of 100 points. "Wine Enthusiast" has rated the wine "Prunotto Dolcetto d'Alba, Piedmont, Italy" from the vintage 2009 on 09.01.2010 with 87 of 100 points. "Wine Spectator" has rated the wine "Prunotto Dolcetto d'Alba, Piedmont, Italy" from the vintage 2007 on 15.12.2008 with 85 of 100 points. "Vinous Antonio Galloni" has rated the wine "Prunotto Dolcetto d'Alba, Piedmont, Italy" from the vintage 2007 on 01.08.2008 with 88 of 100 points. "Wine Spectator" has rated the wine "Prunotto Dolcetto d'Alba, Piedmont, Italy" from the vintage 2006 on 15.12.2007 with 85 of 100 points. "Wine Spectator" has rated the wine "Prunotto Dolcetto d'Alba, Piedmont, Italy" from the vintage 2005 on 15.12.2006 with 85 of 100 points. "Wine Spectator" has rated the wine "Prunotto Dolcetto d'Alba, Piedmont, Italy" from the vintage 2003 on 28.02.2005 with 83 of 100 points. "Wine Spectator" has rated the wine "Prunotto Dolcetto d'Alba, Piedmont, Italy" from the vintage 2002 on 30.11.2003 with 80 of 100 points. "Wine Spectator" has rated the wine "Prunotto Dolcetto d'Alba, Piedmont, Italy" from the vintage 2001 on 15.11.2002 with 84 of 100 points. "Wine Spectator" has rated the wine "Prunotto Dolcetto d'Alba, Piedmont, Italy" from the vintage 2000 on 30.11.2001 with 84 of 100 points. "Wine Spectator" has rated the wine "Prunotto Dolcetto d'Alba, Piedmont, Italy" from the vintage 1999 on 31.12.2000 with 82 of 100 points. "Wine Enthusiast" has rated the wine "Prunotto Dolcetto d'Alba, Piedmont, Italy" from the vintage 1997 on 04.01.2000 with 84 of 100 points. "Wine Spectator" has rated the wine "Prunotto Dolcetto d'Alba, Piedmont, Italy" from the vintage 1998 on 31.07.1999 with 88 of 100 points. "Wine Spectator" has rated the wine "Prunotto Dolcetto d'Alba, Piedmont, Italy" from the vintage 1997 on 31.10.1998 with 83 of 100 points. "Wine Spectator" has rated the wine "Prunotto Dolcetto d'Alba, Piedmont, Italy" from the vintage 1996 on 31.10.1997 with 85 of 100 points. 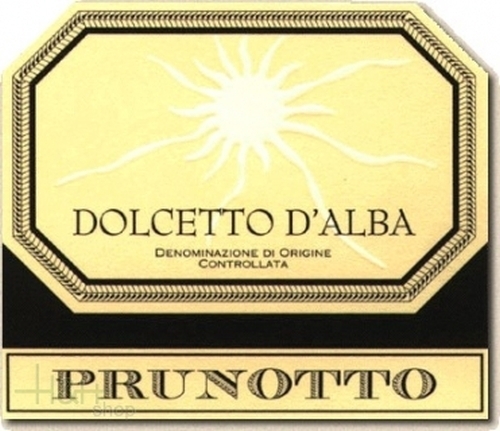 "CellarTracker" has rated the wine "Prunotto Dolcetto d'Alba, Piedmont, Italy" from the vintage 2009 with 88 of 100 points. "Stephen Tanzer" has rated the wine "Prunotto Dolcetto d'Alba, Piedmont, Italy" from the vintage 1999 with 88 of 100 points.